IAEA Director General Amano: "I have faith in the ingenuity of human beings." 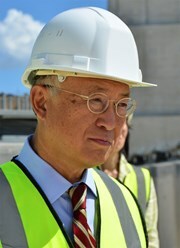 On Friday 6 July, the ITER Organization welcomed the following distinguished guests: Yukiya Amano, Director General of the International Atomic Energy Agency (IAEA); Shunji Yanai, President of the International Tribunal for the Law of the Seas (ITLOS), and Ichiro Komatsu, Ambassador of Japan in France. 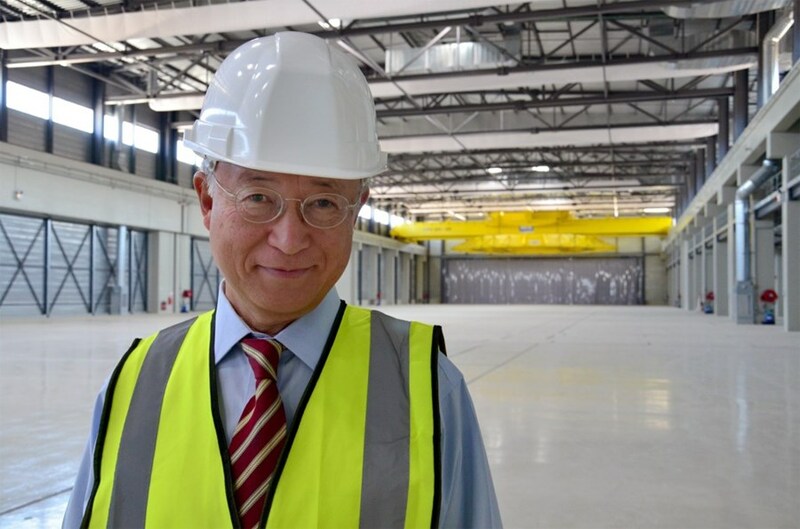 ITER Director-General Osamu Motojima gave a general presentation in which he highlighted recent construction and licensing milestones. A large party of senior management accompanied the visitors to the ITER platform where, in 24 months, major steps toward building ITER have been made. 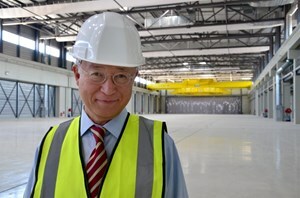 In a short interview with Newsline, Director General Amano reflects on the role of the IAEA, his perception of fusion and ITER, and the energy challenges that will characterize the decades to come. Follow this link to view images of the visit. Director General Amano, do you consider that after Fukushima the perspective on nuclear energy has changed fundamentally? Actually no, I do not. The most important change is that global public opinion has become very sceptical about nuclear safety. Many people have lost confidence that nuclear power plants can be operated safely. Restoring this confidence represents a major challenge for governments, plant operators and nuclear regulators. I believe it can be done, but it will take time and an unshakeable commitment to putting safety first—always—and to transparency. However, as far as the future of nuclear power is concerned, all the indications point to a growing number of nuclear power plants throughout the world in the next 20 to 30 years. There are exceptions such as Germany, which has decided to close all of its existing reactors, and Switzerland, which has decided not to build any new ones. But at the global level, the use of nuclear power is set to continue to grow, although perhaps at a slower rate than we anticipated before Fukushima Daiichi. The latest IAEA projections suggest that at least 90 new nuclear power reactors will come online in the next 20 years, on top of the 435 in operation at the moment. That is the conservative estimate—the actual increase could be much higher. This is borne out by my discussions with government leaders when I visit our Member States. They are of course interested in exploring the potential of renewable energy, but many of them see it as an adjunct to nuclear—and other major sources of energy—not as an alternative. ... and in the Tokamak Seismic Pit. What is your perception of fusion energy and ITER? Nuclear fusion holds the promise of an inexhaustible, clean and safe source of energy—one of the dreams of humankind. If this dream can be realized, it will have dramatic implications for the future on many levels, from economic growth to climate change and fighting poverty. However, fusion is technically very difficult, and many key problems, in material science for example, are still to be solved. The ITER Project, with Member states representing half of the world's population, is a historic milestone on the way to fusion energy. It is a huge challenge, both from an engineering and a management point of view. This challenge can only be met through concerted international efforts. My hope is that ITER will open the door to fusion power and provide the ITER Members with the technology to design and build the first generation of fusion power stations. The challenge is huge, but I have faith in the ingenuity of human beings and the ability of our scientists and engineers to overcome even the most daunting technological hurdles. What is the IAEA's role in facilitating fusion research? The IAEA played the role of godparent to the ITER Project as it grew from an idea floated at the 1985 Summit in Geneva between US President Reagan and Soviet General Secretary Gorbachev into an international organization in 2006. Today, the IAEA serves the worldwide fusion and plasma physics community by publishing the leading scientific journal and organizing the largest biennial conference in the field. We also directly support research through Coordinated Research Programmes and the provision of nuclear data. ITER has a special place in all of these activities and we regularly organize workshops and physics schools together. For the more than 120 IAEA Member States that are not part of the ITER Organization, the IAEA performs an important bridging function, disseminating knowledge from ITER to the wider community and providing a platform for exchange between ITER and the rest of the world. What is your perception of an "ideal world" as far as energy issues are concerned? I would not presume to tell countries what is the ideal energy mix for them as their individual circumstances vary so widely. However, I believe that access to energy is essential for all countries for their development and for the welfare of their people. We should make the best use we can of all the sources of energy at our disposal, in a clean, efficient and sustainable way. All sources of energy have their advantages and disadvantages, and they need to be looked at from a wider perspective. Clearly, fossil fuels will play a central role for many decades to come. Equally, renewables will play an important role, and I welcome efforts to improve their effectiveness. And, as I mentioned earlier, I see the use of nuclear energy continuing to grow in the coming decades.